None of our old furniture fit in size or style when we moved to our little project house on the water. 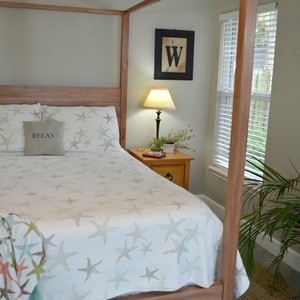 The further along we’d get with house renovations and makeovers, the more our old bed looked out of place. What’s a girl to do when she has a tiny budget for a big ticket item? DIY it of course. Let me share a few housekeeping items before you start that will make this project even easier to tackle. 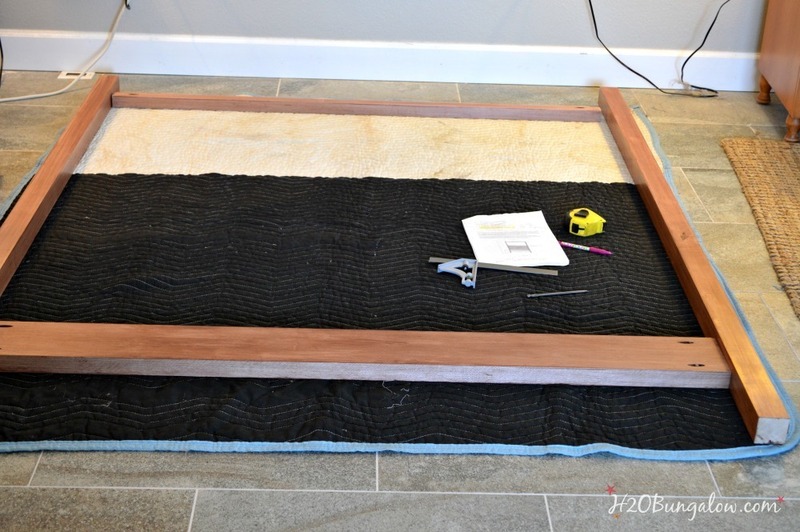 First, this bed needs to be assembled in the space in the bedroom it will be in. The assembled parts are larger than a doorway. I stained and waxed my wood pieces before assembling. Since the wood was already finished, you’ll see that I placed a heavy moving blanket on the floor to protect the wood from scratches. 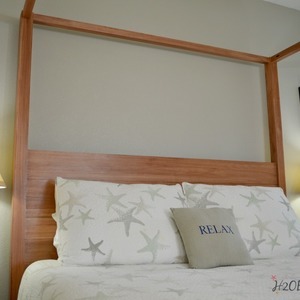 Plans and Cut List is for a Queen Size Bed. 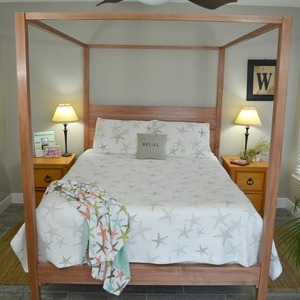 Click here to download H2O Bungalow's project plans for this How-To! 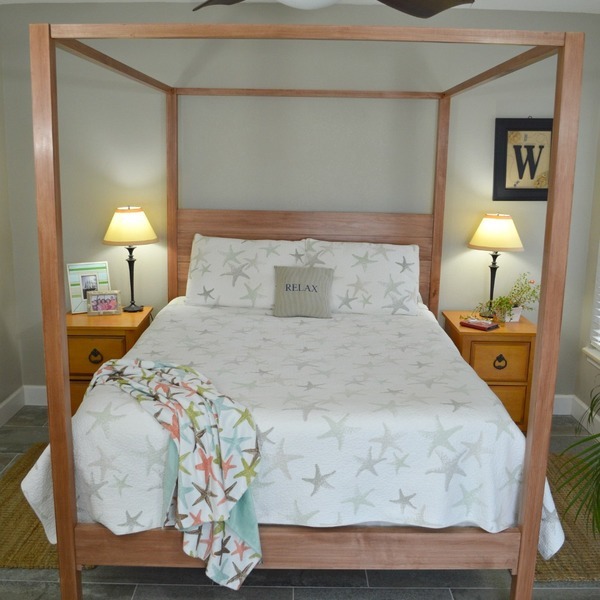 Prepare: If you are planing to finish the wood before assembling the bed, prepare by cutting, sanding and finish all of the maple pieces. 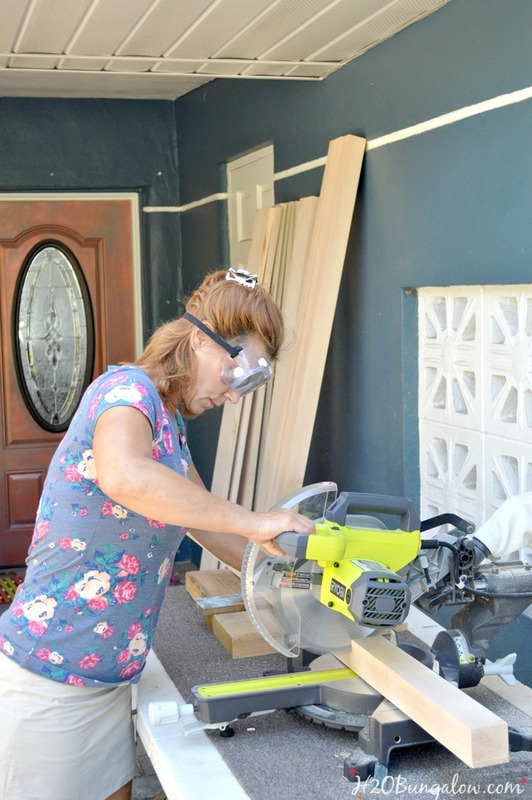 I also choose to drill my pocket holes before finishing my wood. Assemble the headboard frame. 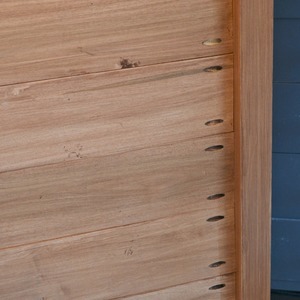 Set the pocket hole jig for 1 ½” material and drill pocket holes in each end of the upper rail and lower headboard plank. 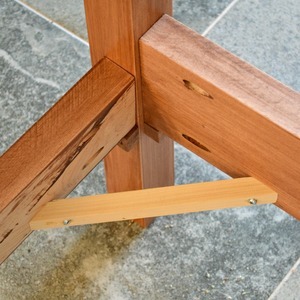 Secure the pieces to the bed post with glue and 2” pocket hole screws. 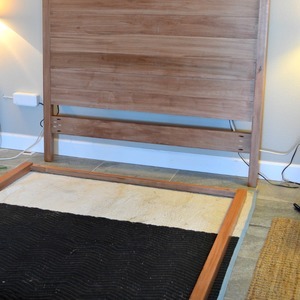 The inside face of the lower headboard plank will be flush with the front of the bed post which is the side facing the mattress. 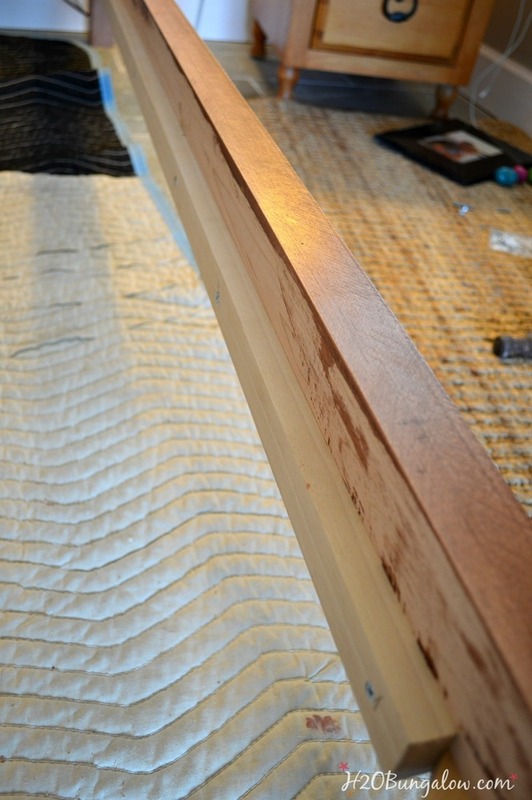 Center the upper rail on the bedpost with the pocket holes facing out, and attach. To keep a consistent center placement for all the joined pieces on the bed posts, I cut a ¾” x 5” piece of wood as a guide. 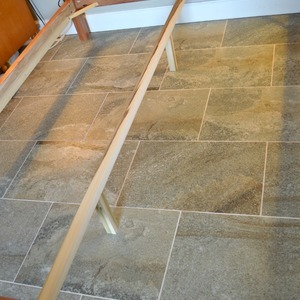 Example: lay the bedpost on the floor. Position the guide piece next to the bedpost and position the upper rail on top of the guide. This will center the pieces perfectly while joining all of the pieces to the bedposts. Install headboard planks. 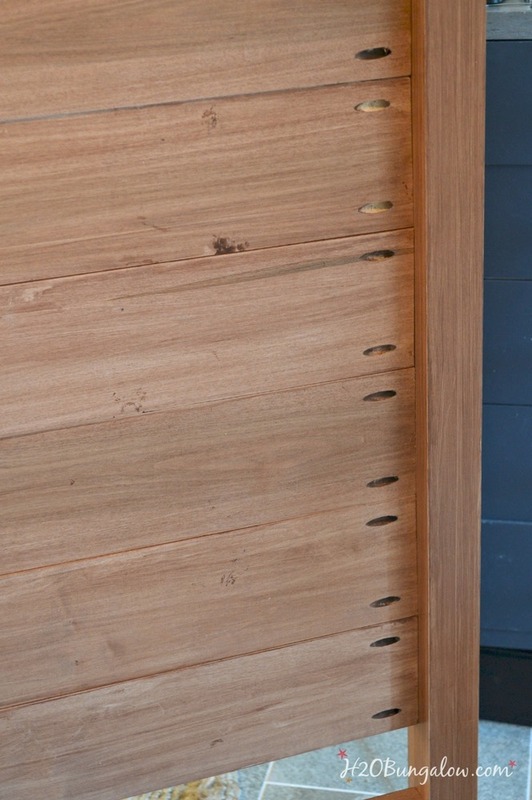 Set the pocket hole jig for ¾” material and drill pocket holes in each end of the headboard planks. 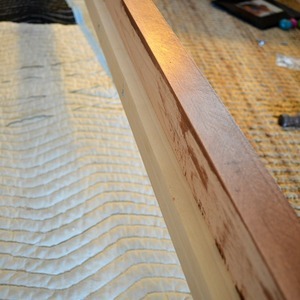 Secure the planks to the bed posts using glue and 1 ¼” pocket hole screws on the back of the headboard. 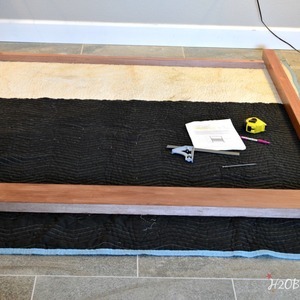 Assemble the footboard frame. Set the pocket hole jig for 1 ½” material. Drill pocket holes in each end of the top rail and footboard. 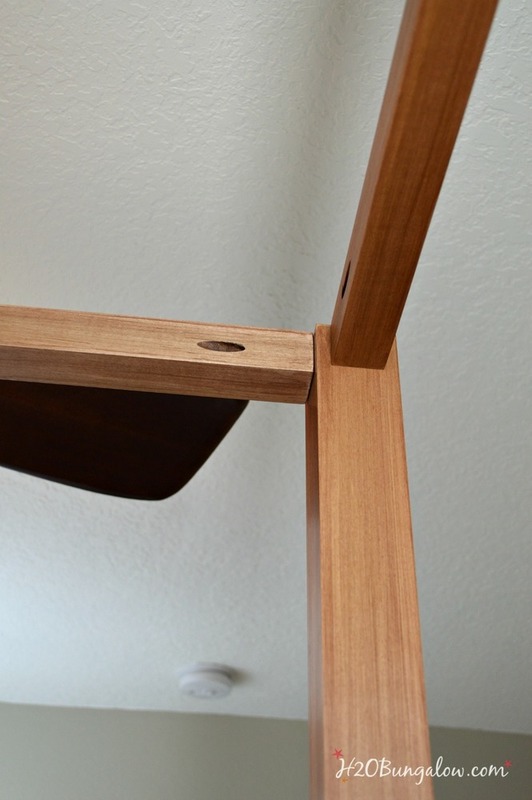 Secure the pieces to the legs using glue and 2” pocket hole screws. Attach the upper and lower side rails. 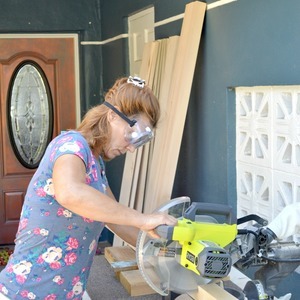 Drill pocket holes in each end of the side rails and upper rails with the jig set to 1 ½”. 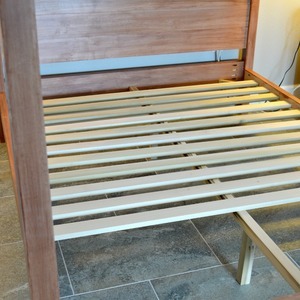 Secure them to the bed posts using 2 ” pocket screws. Use the wood guide to position. Note: Do NOT use glue on this step in case the bed needs to be disassembled to move! Optional add extra support. 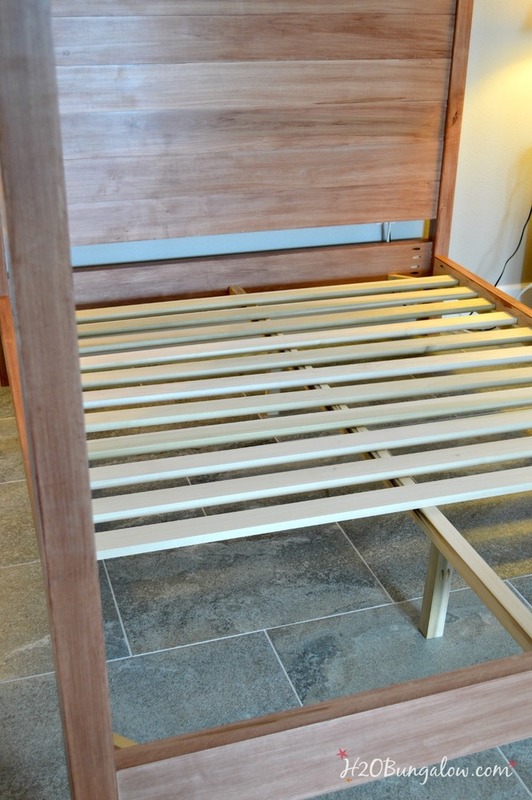 I added small cleats under each joint on the bedposts and struts in the corners. I had an issue with my screws shearing off in the hardwood bedposts. I couldn’t drill pilot holes in the pocket holes to prevent this. My bed posts were extremely dense. 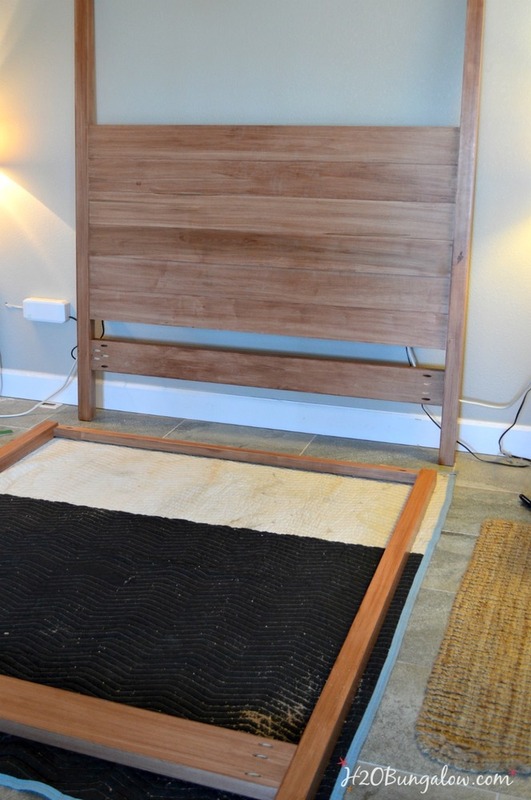 You may notice a few extra pocket holes in my lower foot board and headboard pictures because of this challenge. I had to use shorter screws to join some of these areas. I added extra support which you’ll see below. If you choose to add this, you’ll need to shorten the side rail cleats. Attach the slat cleats. 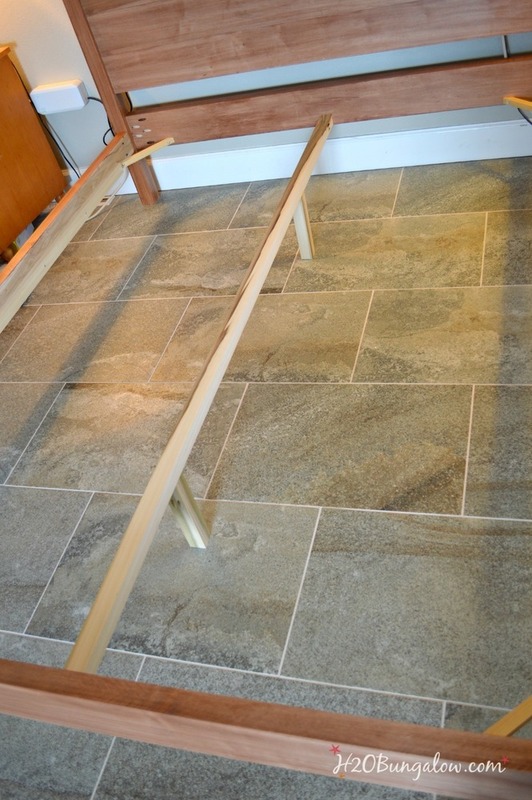 Secure the cleats to the side rails using countersunk 1 ½” wood screws approximately every 12”. The bottom edge of the cleat will be flush with the bottom edge of the side rail. Assemble and attach center support. Drill pocket holes in each end of the center 2” x 2” long support piece and one end only on each 2” x 2” center support leg. 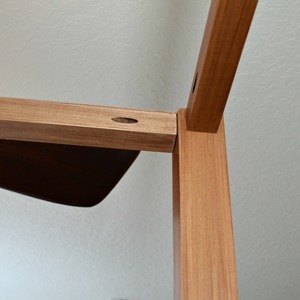 Secure the 2” x 2” legs to the center support using glue and 2” pocket hole screws 18” from each end of the support bar. 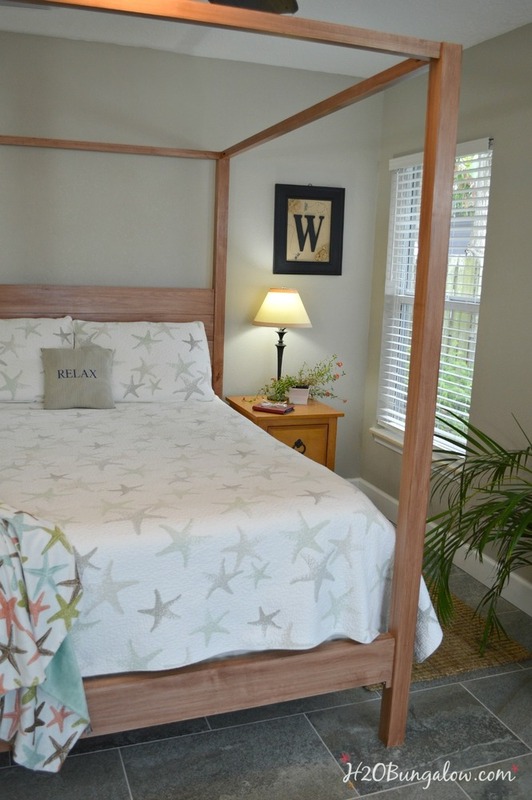 The contemporary features of slim footboards and siderails,as well as square bedposts work well with many decor styles. Wendi, this looks absolutely amazing! I love it and can't wait to build one myself. This would look awesome with the cherry lumber I have just waiting for that project to come along. 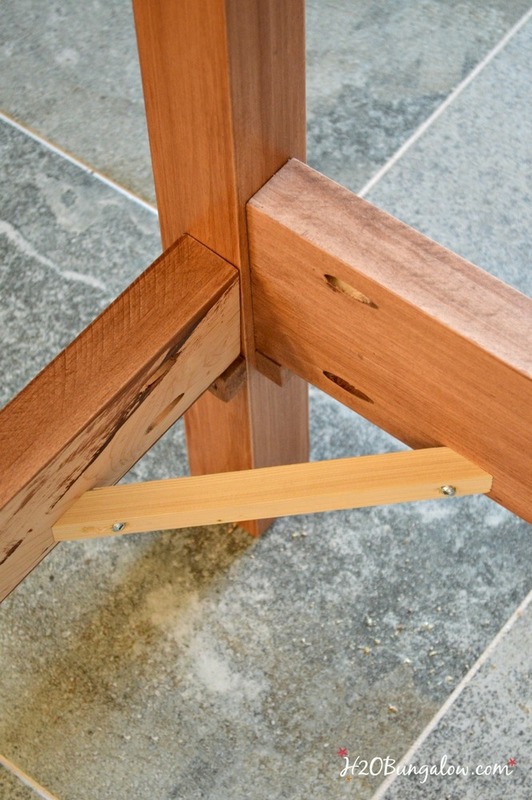 Mortise and tenon joints will be far superior to pocket screws for a frame that will take much abuse over the years. I urge you to start over and build this bed the way it should have been built from the beginning.